The Israel lobby (at times called the Zionist lobby) is the diverse coalition of those who, as individuals and/or as groups, seek to influence the foreign policy of the United States in support of Israel or the policies of the government of Israel. The lobby consists of secular, Christian, and Jewish-American individuals and groups. The largest pro-Israel lobbying group is Christians United for Israel; the American Israel Public Affairs Committee (AIPAC) is a leading organization within the lobby, speaking on behalf of a coalition of American Jewish groups. Christian Zionist William Eugene Blackstone. George Bush (Biblical scholar) and Christian restorationist. A Christian belief in the return of the Jews to the Holy Land has roots in the US, which pre-date both the establishment of the Zionist movement and the establishment of Israel. Lobbying by these groups, to influence the US government in ways similar to Zionist ideology, dates back to at least the 19th century. In 1844, Christian restorationist George Bush, a professor of Hebrew at New York University and distantly related to the Bush political family, published a book entitled The Valley of Vision; or, The Dry Bones of Israel Revived. In it he denounced "the thralldom and oppression which has so long ground them (the Jews) to the dust," and called for "elevating" the Jews "to a rank of honorable repute among the nations of the earth" by restoring the Jews to the land of Israel where the bulk would be converted to Christianity. This, according to Bush, would benefit not only the Jews, but all of mankind, forming a "link of communication" between humanity and God. "It will blaze in notoriety ...". "It will flash a splendid demonstration upon all kindreds and tongues of the truth." The book sold about a million copies in the antebellum period. The Blackstone Memorial of 1891 was also a significant Christian Restorationist petition effort, led by William Eugene Blackstone, to persuade President Benjamin Harrison to pressure the Ottoman Sultan for the delivery of Palestine to the Jews. 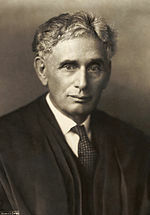 Starting in 1914, the involvement of Louis Brandeis and his brand of American Zionism made Jewish Zionism a force on the American scene for the first time; under his leadership it had increased ten-fold to about 200,000. As chair of the American Provisional Executive Committee for General Zionist Affairs, Brandeis raised millions of dollars to relieve Jewish suffering in war-torn Europe, and from that time "became the financial center for the world Zionist movement." The British Balfour Declaration of 1917 additionally advanced the Zionist movement and gave it official legitimacy. The US Congress passed the first joint resolution stating its support for a homeland in Palestine for the Jewish people on September 21, 1922. The same day, the Mandate of Palestine was approved by the Council of the League of Nations. Zionist lobbying in the United States aided the creation of the State of Israel in 1947-48. The preparation of and voting for the United Nations Partition Plan for Palestine which preceded the Israeli Declaration of Independence, was met with an outpouring of Jewish American support and advocacy in Washington. President Truman later noted, "The facts were that not only were there pressure movements around the United Nations unlike anything that had been seen there before, but that the White House, too, was subjected to a constant barrage. I do not think I ever had as much pressure and propaganda aimed at the White House as I had in this instance. The persistence of a few of the extreme Zionist leaders—actuated by political motives and engaging in political threats—disturbed and annoyed me." In the 1950s, the American Zionist Committee for Public Affairs was created by Isaiah L. "Si" Kenen. During the Eisenhower administration, Israel's concerns were not at the forefront. Other problems in the Middle East and USSR were paramount, and Israel's U.S. supporters were not as active as they had been. AZCPA formed a pro-Israel lobbying committee to counter rumors that the Eisenhower administration was going to investigate the American Zionist Council. AZCPA's Executive Committee decided to change their name from American Zionist Committee for Public Affairs to American Israel Public Affairs Committee. The relationship between Israel and the government of the United States began with strong popular support for Israel and governmental reservations about the wisdom of creating a Jewish state; formal inter-government relations remained chilly until 1967. Before 1967, the government of the United States provided some aid but was generally neutral towards Israel. In each year between 1976 and 2994, Israel received the most direct foreign assistance from the USA of any nation, approximately 0.001% of the $3 trillion US annual budget[circular reference] AIPAC "has grown into a 100,000-member national grassroots movement" and claims that it is America's "pro-Israel lobby." The pro-Israel lobby is composed of formal and informal components. Support for Israel is strong among American Christians of many denominations. Informal Christian support for Israel includes a broad range varieties support for Israel ranging from the programming and news coverage on the Christian Broadcasting Network and the Christian Television Network to the more informal support of the annual Day of Prayer for the Peace of Jerusalem. American Jews recognize the importance of support for Israel because of the dire consequences that could follow from the alternative. Despite the fact that Israel is often referred to now as the fourth most powerful country in the world, the perceived threat to Israel is not military defeat, it is annihilation. At the same time, American Jews are frightened of what might happen in the United States if they do not have political power. The formal component of the Israel lobby consists of organized lobby groups, political action committees (PACs), think tanks and media watchdog groups. The Center for Responsive Politics, which tracks all lobbies and PACs, describes the 'background' of those 'Pro-Israel' as, "A nationwide network of local political action committees, generally named after the region their donors come from, supplies much of the pro-Israel money in US politics. Additional funds also come from individuals who bundle contributions to candidates favored by the PACs. The donors' unified goal is to build stronger US-Israel relations and to support Israel in its negotiations and armed conflicts with its Arab neighbors." Christians United for Israel, the US "largest" pro-Israel lobby. The Conference of Presidents of Major American Jewish Organizations which "is the main contact between the Jewish community and the executive branch" of the US government. Christians United for Israel give "every pro-Israel Christian and Christian church the opportunity to stand up and speak up for Israel." 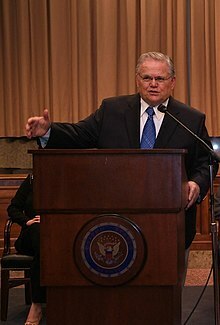 According to the group's founder and head, Pastor John Hagee, the members "ask the leadership of our government to stop putting pressure on Israel to divide Jerusalem and the land of Israel." In his 2006 book The Restoration of Israel: Christian Zionism in Religion, Literature, and Politics, sociologist Gerhard Falk describes the Evangelical Christian groups that lobby on behalf of Israel as being so numerous that "it is not possible to list" them all, although many are linked via the National Association of Evangelicals. It is a "powerful religious lobby" that actively supports Israel in Washington. According to the author of Kingdom Coming: The Rise of Christian Nationalism, Michelle Goldberg, "Evangelical Christians have substantial influence on US Middle East Policy, more so than some better-known names such as AIPAC." According to Mitchell Bard, the two Jewish groups aim to present policy makers with unified and representative messages via the aggregation and filtering of the diversity of opinions held by smaller pro-Israel lobby groups and the wider American Jewish community. The diverse spectrum of opinions held by American Jewry is reflected in the many formal pro-Israel groups, and as such some analysts make a distinction within the Israel lobby between right-leaning and left-leaning groups. This diversity became more pronounced following Israel's acceptance of the Oslo Accords, which split "liberal universalists" and "hard-core Zionists --- the Orthodox community and right wing Jews". This division mirrored a similar split for and against the Oslo process in Israel, and led to a parallel rift within the pro-Israel lobby. During the 2008 election campaign, Barack Obama implicitly noted differences within the lobby in his comment that "there is a strain within the pro-Israel community that says, 'unless you adopt an unwavering pro-Likud approach to Israel, that you're anti-Israel,' and that can't be the measure of our friendship with Israel." Commentary Magazine, notes "It was an odd choice of words—Likud has not been Israel's governing party for more than three years—but what Obama clearly meant was that an American politician should not have to express fealty to the most hard-line ideas relating to Israel's security to be considered a supporter of Israel's." US foreign policy scholars John Mearsheimer and Stephen Walt (of University of Chicago and Harvard University, respectively), focusing almost exclusively on Jewish groups, define the core of the lobby to include AIPAC, the Washington Institute for Near East Policy, the Anti-Defamation League and Christians United for Israel. Other key organizations which they state work to benefit Israel, in many cases by influencing US foreign policy, include the American Jewish Congress, the Zionist Organization of America, the Israel Policy Forum, the American Jewish Committee, the Religious Action Center of Reform Judaism, Americans for a Safe Israel, American Friends of Likud, Mercaz-USA, and Hadassah. Fifty-one of the largest and most important come together in the Conference of Presidents of Major American Jewish Organizations, whose self-described mission includes "forging diverse groups into a unified force for Israel's well-being" and working to "strengthen and foster the special US-Israel relationship"
Stephen Zunes, in a response to Mearsheimer and Walt, lists "Americans for Peace Now, the Tikkun Community, Brit Tzedek v'Shalom, and the Israel Policy Forum" as "pro-Israel" organizations that, unlike the right-leaning organizations focused on by Mearsheimer and Walt, are opposed to "the occupation, the settlements, the separation wall, and Washington's unconditional support for Israeli policies." These organizations, however, are not PACs and therefore, like AIPAC, are prohibited by campaign finance regulations from financially supporting political campaigns of candidates for federal office. John Mearsheimer and Stephen Walt state in their controversial bestseller, The Israel Lobby and U.S. Foreign Policy, that the tone of the right-leaning component of the Israel lobby results from the influence of the leaders of the two top lobby groups: AIPAC and the Conference of Presidents of Major American Jewish Organizations. They go on to list, as right-leaning think tanks associated with the lobby, the Washington Institute for Near East Policy, the American Enterprise Institute, and the Hudson Institute. They also state that the media watchdog group Committee for Accuracy in Middle East Reporting in America (CAMERA) is part of the right-wing component of the lobby. In The Case for Peace, Alan Dershowitz also of Harvard, argues that the most right-leaning pro-Israel groups in the United States are not Jews at all, but Evangelical Christians. Dershowitz cites "Stand for Israel, an organization devoted to mobilizing Evangelical Christian support for Israel" co-founded by "[f]ormer Christian Coalition executive director Ralph Reed." Although the rhetoric of most groups like Stand for Israel is similar to their Jewish-based counterparts, some individuals have based their support on specific biblical passages, thus they have been vulnerable to criticism from Israelis and US Jews for having "ulterior motives" such as the fulfillment of "prerequisite to the Second Coming" or having "better access for proselytizing among Jews." In April 2008, J Street was established, describing itself as the only federal "pro-peace, pro-Israel" PAC. Its platform explicitly supports a two-state solution. Its claimed goal is to provide political and financial support to candidates for federal office from US citizens who believe a new direction in US policy will advance US interests in the Middle East and promote real peace and security for Israel. Founded by former President Bill Clinton advisor Jeremy Ben Ami and policy analyst Daniel Levy and supported by prominent Israeli politicians and high-ranking officers (see Letter of support from prominent Israeli leaders), J Street supports politicians who favor diplomatic solutions over military ones, including with Iran; multilateral over unilateral approaches to conflict resolution; and dialogue over confrontation with a wide range of countries and actors. The means via which Israel lobby groups exert influence are similar to the means via which other similar lobbies, such as the National Rifle Association (NRA) and the AARP (formerly known as "American Association of Retired Persons"), exert influence. A number of commentators have asserted that the Israel lobby has undue or pervasive influence over U.S. foreign policy in the Middle East. However, other commentators note that no similar volume of criticism exists concerning the NRA, AARP or other major political lobbies, and claim that much of this criticism is based on antisemitic notions of a Jewish conspiracy. According to Bard, "Jews have devoted themselves to politics with almost religious fervor." He cites that "Jews have the highest percentage voter turnout of any ethnic group" and that of the American Jewish population "roughly 94 percent live in thirteen key electoral college states" which alone "are worth enough electoral votes to elect the president. If you add the non-Jews shown by opinion polls to be as pro-Israel as Jews, it is clear Israel has the support of one of the largest veto groups in the country." Bard goes on to say that for United States congressmen "there are no benefits to candidates taking an openly anti-Israel stance and considerable costs in both loss of campaign contributions and votes from Jews and non-Jews alike." "Most important fact about the Jewish vote in America", according to Jeffrey S. Helmreich of the Jerusalem Center for Public Affairs, "lies in the fact that it is a uniquely swayable bloc. ... The issue of support for Israel [by a candidate] has proven capable of spurring a sizable portion of Jews to switch parties—in large enough numbers to tip the scales in national or statewide elections. Moreover, the "Israel swing vote" is especially open to political courtship because, unlike the interests of other minority groups, support for Israel has long been compatible with traditional Republican and Democratic agendas. ... On the other hand, being distinctively unsupportive of Israel can significantly hurt a candidate's chances." "Political campaign contributions", writes Mitchell Bard, "are also considered an important means of influence; typically, Jews have been major benefactors." According to Bard, objective quantification that the impact of campaign contributions have on "legislative outcomes, particularly with regard to Israel-related issues" is difficult. This is because raw analysis of contributions statistics do not take into account "non-monetary factors" and whether or not "a candidate is pro-Israel because of receiving a contribution, or receives a donation as a result of taking a position in support of Israel." AIPAC does not give donations directly to candidates, although some of the 100,000 AIPAC members are also important political contributors in their own right. AIPAC does help connect donors with candidates, especially linking the network of pro-Israel political action committees with candidates who support AIPAC's pro-Israel goals. AIPAC president Howard Friedman says "AIPAC meets with every candidate running for Congress. These candidates receive in-depth briefings to help them completely understand the complexities of Israel's predicament and that of the Middle East as a whole. We even ask each candidate to author a 'position paper' on their views of the US-Israel relationship – so it's clear where they stand on the subject." According to Bard, this process of Israel-friendly vs. -unfriendly candidates has become more targeted over time: "In the past, Jewish contributions were less structured and targeted than other interest groups, but this has changed dramatically as Israel-related PACs have proliferated." Among the politicians AIPAC identified as unfriendly to Israel who were defeated include Cynthia McKinney, Paul Findley, Earl F. Hilliard, Pete McCloskey, Senators William Fulbright and Roger Jepsen, and Adlai Stevenson III in his campaign for governor of Illinois in 1982. The defeat of Charles H. Percy, Senator for Illinois until 1985, has been attributed to co-ordinated donations to his opponent after he supported the sale of AWACS planes to Saudi Arabia. Donations included $1.1 million on anti-Percy advertising by Michael Goland, who was also a major contributor to AIPAC. Former executive director of AIPAC, Tom Dine, was quoted in 2008 as saying, "All the Jews in America, from coast to coast, gathered to oust Percy (in 1985). And the American politicians - those who hold public positions now, and those who aspire - got the message". A summary of pro-Israel campaign donations for the period of 1990–2008 collected by Center for Responsive Politics indicates current totals and a general increase in proportional donations to the US Republican party since 1996. The Center for Responsive Politics' 1990–2006 data shows that "pro-Israel interests have contributed $56.8 million in individual, group and soft money donations to federal candidates and party committees since 1990." In contrast, explicitly identified Arab-Americans and Muslim PACs, who are not associated with a particular nation, contributed slightly less than $800,000 during the same (1990–2006) period. In 2006, 60% of the Democratic Party's fundraising from private sources (and 25% of the Republican Party's fundraising) came from pro-Israel PACs, according to a Washington Post estimate, Democratic presidential candidates depend on pro-Israel sources for as much as 60% of money raised from private sources. taking them to Israel on study missions. Once officials have direct exposure to the country, its leaders, geography, and security dilemmas, they typically return more sympathetic to Israel. Politicians also sometimes travel to Israel specifically to demonstrate to the lobby their interest in Israel. Thus, for example, George W. Bush made his one and only trip to Israel before deciding to run for President in what was widely viewed as an effort to win pro-Israel voters' support. Mearsheimer and Walt state that "pro-Israel figures have established a commanding presence at the American Enterprise Institute, the Center for Security Policy, the Foreign Policy Research Institute, the Heritage Foundation, the Hudson Institute, the Institute for Foreign Policy Analysis, and the Jewish Institute for National Security Affairs (JINSA). These think tanks are all decidedly pro-Israel and include few, if any, critics of US support for the Jewish state." In 2002, the Brookings Institution founded the Saban Center for Middle East Policy, named after Haim Saban, an Israeli-American media proprietor, who donated $13 million toward its establishment. Saban has stated of himself, "I'm a one issue guy, and my issue is Israel", and was described by the New York Times as a "tireless cheerleader for Israel." The Centre is directed by AIPAC's former deputy director of research, Martin Indyk. Frontline, an Indian current affairs magazine, asked rhetorically why the administration of George W Bush that seemed "so eager to please [Bush's] Gulf allies, particularly the Saudis, go out of its way to take the side of Ariel Sharon's Israel? Two public policy organizations give us a sense of an answer: the Washington Institute for Near East Policy (WINEP) and the Jewish Institute for National Security Affairs." Frontline reported that "WINEP tended to toe the line of whatever party came to power in Israel" while "JINSA was the U.S. offshoot of the right-wing Likud Party." According to Frontline, JINSA had close ties to the administration of George W Bush in that it "draws from the most conservative hawks in the U.S. establishment for its board of directors" including Vice-President Richard Cheney, and Bush administration appointees John Bolton, Douglas Feith, Paul Wolfowitz, Lewis Libby, Zalmay Khalilzad, Richard Armitage and Elliott Abrams. Jason Vest, writing in The Nation, alleges that both JINSA and the Center for Security Policy thinktanks are "underwritten by far-right American Zionists" and that they both "effectively hold there is no difference between US and Israeli national security interests, and that the only way to assure continued safety and prosperity for both countries is through hegemony in the Middle East – a hegemony achieved with the traditional cold war recipe of feints, force, clientism and covert action." Stephen Zunes wrote in 2006 that "mainstream and conservative Jewish organizations have mobilized considerable lobbying resources, financial contributions from the Jewish community, and citizen pressure on the news media and other forums of public discourse in support of the Israeli government." Also in 2006, journalist Michael Massing wrote that "Jewish organizations are quick to detect bias in the coverage of the Middle East, and quick to complain about it. That's especially true of late. As The Jewish Daily Forward observed in late April , 'rooting out perceived anti-Israel bias in the media has become for many American Jews the most direct and emotional outlet for connecting with the conflict 6,000 miles away.'" Indicative of the diversity of opinion in the early 2000s was a 2003 Boston Globe profile of the CAMERA media watchdog group in which Mark Jurkowitz observes: "To its supporters, CAMERA is figuratively - and perhaps literally - doing God's work, battling insidious anti-Israeli bias in the media. But its detractors see CAMERA as a myopic and vindictive special interest group trying to muscle its views into media coverage." A former spokesman for the Israeli Consulate in New York City said that the result of this lobbying of the media was: "Of course, a lot of self-censorship goes on. Journalists, editors, and politicians are going to think twice about criticizing Israel if they know they are going to get thousands of angry calls in a matter of hours. The Jewish lobby is good at orchestrating pressure." In addition to traditional media, Israeli public relations during this time period were also supported with software called the Megaphone desktop tool, which was designed and promoted by pro-Israel interest groups and diplomats. Regarding the 'Megaphone', the Times Online reported in 2006 that the Israeli Foreign Ministry "ordered trainee diplomats to track websites and chatrooms so that networks of US and European groups with hundreds of thousands of Jewish activists can place supportive messages." According to a Jerusalem Post article on the 'Megaphone', Israel's Foreign Ministry was (in 2006) "urging supporters of Israel everywhere to become cyberspace soldiers 'in the new battleground for Israel's image.'" Christopher Williams wrote for The Register: "However it is used, Megaphone is effectively a high-tech exercise in ballot-stuffing. We're calling it lobbyware ." Since the early 2000s, there have been a number of organizations that focus on what could be called "pro-Israel activism" on college campuses. With the outbreak of the Al-Aqsa Intifada in 2001, these groups became increasingly visible. In 2002 an umbrella organization that includes many of these groups, known as the Israel on Campus Coalition, was formed as a result of what they felt were "the worrisome rise in anti-Israel activities on college campuses across North America". The stated mission of the Israel on Campus Coalition is to "foster support for Israel" and "cultivate an Israel friendly university environment". Members of the Israel on Campus Coalition include the Zionist Organization of America, AIPAC, Americans for Peace Now, the Anti-Defamation League, Kesher, the Union of Progressive Zionists (Ameinu and Meretz USA/Partners for Progressive Israel). Although these groups are largely united in their support of Israel, there was a major internal conflict in 2007 when the right-wing Zionist Organization of America unsuccessfully attempted to remove the left-wing Union of Progressive Zionists from the coalition after the latter group sponsored lectures by a group of former Israel Defense Forces soldiers who criticized the Israeli Occupation of the West Bank and Gaza. There are some who feel that pro-Israel activism on college campuses can cross the line from advocacy to outright intimidation. One highly publicized accusation comes from former US President Jimmy Carter, who complained of great difficulty in gaining access to a number of universities to discuss his new book Palestine Peace Not Apartheid which criticized certain Israeli policies. In October 2007, a group of 300 academics about 300 academics under the name The Ad Hoc Committee to Defend the University issued a statement in Inside Higher Ed calling for academic freedom from political pressure, in particular advocating openness and dialogue with groups identifying as supporters of Israel. In December 2007, several student leaders who advocated pro-Israel films and groups on college campuses were supported by advocacy group StandWithUs as "emissaries of the Jewish state" for their work and would receive up to $1,000 a year from the Emerson foundation for their efforts. Rabbi Alexander Schindler, former chair of the Conference of Presidents of Major Jewish Organizations (a US advocacy group), told an Israeli magazine in 1976, "The Presidents' Conference and its members have been instruments of official governmental Israeli policy. It was seen as our task to receive directions from government circles and to do our best no matter what to affect the Jewish community." Hyman Bookbinder, a high-ranking official of the American Jewish Committee, once said "Unless something is terribly pressing, really critical or fundamental, you parrot Israel's line in order to retain American support. As American Jews, we don't go around saying Israel is wrong about its policies." Bard noted in 2009 that "by framing the issues in terms of the national interest, AIPAC can attract broader support than would ever be possible if it was perceived to represent only the interests of Israel. This does not mean AIPAC does not have a close relationship with Israeli officials, it does, albeit unofficially. Even so, the lobby some times comes into conflict with the Israeli government." Since the early 20th century both Israeli and Greek lobbies have been working in parallel in order to prevent any rising tensions in the unstable Eastern Mediterranean. Greek and Israeli lobbies have maintained excellent ties even before the establishment of the bilateral relations of Greece with Israel. American Jewish Committee delegates have visited Greece and maintain contacts with various Greek officials of both political and military backgrounds. In their annual meeting in the New York City in December 2012 Greek and Israeli lobbies have assured that relations between Greece and Israel and to some extent Cyprus remain strong due to the common interest of the three countries for democracy and stability in the Eastern Mediterranean. Chairman of the Board of Trustees Nicholas Karacostas together with the other Greek American representatives have announced that both their lobbying groups will remain in contact ahead of the upcoming extraction of natural gas in both Israel and Cyprus, as part of their wider Energy Triangle. Chairman of the American Israel Public Affairs Committee Alan Solow has expressed his enthusiasm in an interview by George Gilson that there is an increasing exchange of information between the two lobbies and leaders of both communities consistently join forces to solve their common problems. A new joint action committee for the Greek-Israeli alliance has been created in the U.S. Congress in early 2013. The creation and goals of the Greek-Israeli Caucus under the name Congressional Hellenic-Israel Alliance were announced at a special event held in the Congress. It is co-chaired by Congress members Gus Bilirakis the Republican representative from Florida and Ted Deutch the Democrat from Florida, and the Greek-Israeli Caucus consists of powerful members of both Republican and Democratic party. It is estimated that it may become the most important pressure group in Congress by 2014. On March 13, 2013 in Washington the Israeli ambassador Michael Oren hosted the launching of a new congressional grouping dedicated to improving Israeli-Greek-Cypriot ties. Attending the launch were the co-chairmen of the newly established Hellenic-Israel Caucus, Ted Deutch and Gus Bilirakis as well as lawmakers including John Sarbanes and Eliot Engel, the senior Democrat on the US House of Representatives Foreign Affairs Committee. Israeli Ambassador Michael Oren in his remarks at the dinner at his residence touted shared economic and strategic interests among Greece, Cyprus and Israel. The Greek ambassador Christos Panagopoulos in Washington announced that cooperation among the three countries would bring "peace, stability and prosperity" to the region. Also addressing the event was Olympia Neocleous, the charge d'affaires at the Cypriot embassy in Washington. In the passing of Greek-American Leader Andrew Athens AJC honored his pioneering work to advance Greek-Jewish and Hellenic-Israeli ties more than once. The most recent occasion occurred in recognition of Athens' 90th birthday before AJC's National Board of Governors and invited guests from the political and diplomatic communities, in his hometown of Chicago in 2011. Partnering early on with his cherished friend, the late Maynard Wishner, a fellow Chicagoan and AJC national leader, Athens spearheaded a number of joint AJC and Greek-American delegations to Greece, Cyprus and Israel. Zunes writes that "assaults on critics of Israeli policies have been more successful in limiting open debate, but this gagging censorship effect stems more from ignorance and liberal guilt than from any all-powerful Israel lobby." He goes on to explain that while "some criticism of Israel really is rooted in anti-Semitism", it is his opinion that some members of the Israel lobby cross the line by labeling intellectually honest critics of Israel as antisemitic. Zunes argues that the mainstream and conservative Jewish organizations have "created a climate of intimidation against many who speak out for peace and human rights or who support the Palestinians' right of self-determination." Zunes has been on the receiving end of this criticism himself "As a result of my opposition to US support for the Israeli government's policies of occupation, colonization and repression, I have been deliberately misquoted, subjected to slander and libel, and falsely accused of being "anti-Semitic" and "supporting terrorism"; my children have been harassed and my university's administration has been bombarded with calls for my dismissal." In his book, The Deadliest Lies, Abraham Foxman referred to the notion that the pro-Israel lobby is trying to censor criticism of Israel as a "canard." Foxman writes that the Jewish community is capable of telling the difference between legitimate criticism of Israel "and the demonization, deligitization, and double standards employed against Israel that is either inherently anti-Semitic or generates an environment of anti-Semitism." Jonathan Rosenblum expressed similar thoughts: "Indeed, if there were an Israel lobby, and labeling all criticism of Israel as anti-Semitic were its tactic, the steady drumbeat of criticism of Israel on elite campuses and in the elite press would be the clearest proof of its inefficacy." Alan Dershowitz wrote that he welcomes "reasoned, contextual and comparative criticism of Israeli policies and actions." If one of the goals of the pro-Israel lobby was to censor criticism of Israel, Dershowitz writes, "it would prove that 'the Lobby' is a lot less powerful than the authors would have us believe." According to William Safire, the term "Israel Lobby" came into use in the 1970s and, similar to the term "China lobby", carries "the pejorative connotation of manipulation." He also writes that supporters of Israel gauge the degree of perceived animus towards the Jewish State by the term chosen to refer to the lobby: "pro-Israel lobby" being used by those with the mildest opposition, followed by "Israel lobby", with the term "Jewish lobby" being employed by those with the most extreme anti-Israel opinions. According to Walt and Mearsheimer, "Using the term 'Israel lobby' is itself somewhat misleading ... One might more accurately dub this the 'pro-Israel community' ..." since this is not the lobby of a foreign country, rather, it is composed of Americans. However, justifying their usage of the term, they write "because many of the key [pro-Israel] groups do lobby, and because the term 'Israel lobby' is used in common parlance (along with labels such as the 'farm lobby', 'insurance lobby', 'gun lobby' and other ethnic lobbies), we have chosen to employ it here." Somehow... I can't shake the idea that the Israel lobby, no matter how powerful, isn't all it is cracked up to be, particularly where it concerns the Bush administrations past and present. Indeed, when I think of pernicious foreign lobbies with disproportionate sway over American politics, I can't see past Saudi Arabia and its royal house, led by King Abdullah. Mearsheimer and Walt have collected and quoted some of the lobbyists' comments on their organizations' political capital. For example, Mearsheimer and Walt quote Morris Amitay, former AIPAC director as saying, "It's almost politically suicidal ... for a member of Congress who wants to seek reelection to take any stand that might be interpreted as anti-policy of the conservative Israeli government." They also quote a Michael Massing article in which an unnamed staffer sympathetic to Israel said, "We can count on well over half the House – 250 to 300 members – to do reflexively whatever AIPAC wants." Similarly they cite former AIPAC official Steven Rosen illustrating AIPAC's power for Jeffrey Goldberg by putting a napkin in front of him and saying, "In twenty-four hours, we could have the signatures of seventy senators on this napkin." never in the time that I led the American negotiations on the Middle East peace process did we take a step because 'the lobby' wanted us to. Nor did we shy away from one because 'the lobby' opposed it. That is not to say that AIPAC and others have no influence. They do. But they don't distort U.S. policy or undermine American interests. Individual journalists each have their own opinions on how powerful the Israel lobby is. Glenn Frankel wrote: "On Capitol Hill the Israel lobby commands large majorities in both the House and Senate." Michael Lind produced a cover piece on the Israel lobby for the UK publication Prospect in 2002 which concluded, "The truth about America's Israel lobby is this: it is not all-powerful, but it is still far too powerful for the good of the U.S. and its alliances in the Middle East and elsewhere.". Tony Judt, writing in the New York Times, asked rhetorically, "Does the Israel Lobby affect our foreign policy choices? Of course – that is one of its goals. ... But does pressure to support Israel distort American decisions? That's a matter of judgment." found the Israeli lobby won; that is, achieved its policy objective, 60 percent of the time. The most important variable was the president's position. When the president supported the lobby, it won 95 percent of the time. At first glance it appears the lobby was only successful because its objectives coincided with those of the president, but the lobby's influence was demonstrated by the fact that it still won 27 percent of the cases when the president opposed its position. According to a public opinion poll by Zogby International of 1,036 likely voters from October 10–12, 2006, 40% of American voters at least somewhat believe the Israel lobby has been a key factor in going to war in Iraq. The following poll question was used: "Question: Do you strongly agree, somewhat agree, somewhat disagree, or strongly disagree that the work of the Israel lobby on Congress and the Bush administration has been a key factor for going to war in Iraq and now confronting Iran?" In March 2009, Charles W. Freeman, Jr., criticized the lobby after withdrawing his candidacy for the chair of the National Intelligence Council. Freeman said, "The libels on me and their easily traceable email trails show conclusively that there is a powerful lobby determined to prevent any view other than its own from being aired . ... The tactics of the Israel Lobby plumb the depths of dishonor and indecency . ... The aim of this Lobby is control of the policy process . ... " Members of Congress denied that the Israel lobby had a significant role in their opposition to Freeman's appointment; they cite Freeman's ties with the Saudi and Chinese governments, objections to certain statements made about the Palestinian territories and his lack of experience as the reasons for their opposition. The closest comparison is probably to other ethnic-group based lobbies that attempt to influence American foreign policy decisions such as the Cuban-American lobby, the African-American lobby in foreign policy and the Armenian American lobby, although the lobby has also been compared to the National Rifle Association (NRA) and the lobby for the Pharmaceutical industry. In comparing the Israel Lobby to the NRA, Glenn Frankel concludes that "Nevertheless, the Israel lobby, and AIPAC in particular, gained a reputation as the National Rifle Association of foreign policy: a hard-edged, pugnacious bunch that took names and kept score. But in some ways it was even stronger. The NRA's support was largely confined to right-wing Republicans and rural Democrats. But AIPAC made inroads in both parties and both ends of the ideological spectrum." Zunes describes that some groups who lobby against current U.S. policy on Israel "have accepted funding from autocratic Arab regimes, thereby damaging their credibility" while others have "taken hard-line positions that not only oppose the Israeli occupation but challenge Israel's very right to exist and are therefore not taken seriously by most policymakers." Zunes writes that many lobbying groups on the left, such as Peace Action, are "more prone to complain about the power of the Israel lobby and its affiliated PACs than to do serious lobbying on this issue or condition its own PAC contributions on support for a more moderate U.S. policy" in the region. Noam Chomsky, political activist and professor of linguistics at MIT, writes that "there are far more powerful interests that have a stake in what happens in the Persian Gulf region than does AIPAC [or the Lobby generally], such as the oil companies, the arms industry and other special interests whose lobbying influence and campaign contributions far surpass that of the much-vaunted Zionist lobby and its allied donors to congressional races." However, while comparing the Israel Lobby with the Arab Lobby, Mitchell Bard notes that "From the beginning, the Arab lobby has faced not only a disadvantage in electoral politics but also in organization. There are several politically oriented groups, but many of these are one man operations with little financial or popular support." The Arab American Institute is involved in supporting Arab-American political candidates, but, according to award-winning journalist and stand-up comedian Ray Hanania in a 2006 humor piece, "it's nothing compared to the funds that AIPAC raises not just for Jewish American congressmen, but for congressmen who support Israel." Furthermore, according to Bard, Arab-American lobbies face a problem of motivation; while Jewish Americans feel the need to support their homeland, Israel (as well as other states in the Middle East who have signed peace treaties with Israel) in active, organized ways, Arab-Americans do not appear to have a similar motivation when it comes to their own homelands. Friendly relations between Israel and the U.S. has been and continues to be a tenet of both American and Israeli foreign policy. Israel receives bipartisan support in the U.S. Congress. The Israeli Ministry of Foreign Affairs states that U.S. and Israel share common "economic, political, strategic, and diplomatic concerns" and that the countries exchange "intelligence and military information" and cooperate in an effort to halt international terrorism and illegal drug trade. Furthermore, a majority of American citizens view Israel favorably. When asked how this report could so flatly contradict the Walt and Mearsheimer thesis, Slocombe responded, "There is so much error in the world," and added, "I think it would be interesting to ask them whether they make the same contrary argument about the other countries to whom we also provide something like this kind of support. There are obviously differences, but the principle is the same." The Israel Project noted in 2009 that "when you're talking to Americans, you need to know that when you don't support a two-state solution you risk having a major public relations challenge in America and Europe." In a 2008 editorial, Israeli-American historian and author Michael B. Oren wrote that Israel and the United States are natural allies, despite what the opposition from "much of American academia and influential segments of the media." Oren claimed this was because Israel and the United States shared similar values such as "respect for civic rights and the rule of law" and democracy. Israel and the United States share military intelligence in order to fight terrorism. Oren also noted that "more than 70% of [Americans], according to recent polls, favor robust ties with the Jewish state." Forty years of polling has consistently shown that Americans support Israel in its conflict with the Arabs. ... Both Israel and America were founded by refugees from European religious intolerance; both are rooted in a common religious tradition; Israel is a lively democracy in a part of the world that lacks democracy; Israelis seem self-reliant in the manner of American pioneers; and Israel's enemies, in many cases, seem to be America's enemies as well. It seems as if the Arab masses have been much less upset about Israel's treatment of the Palestinians than they have been about their own treatment at the hands of their unelected leaders. If Israel ceased to exist tomorrow, Arabs would still be upset at the quality of their leadership (and they would still blame the United States for supporting the autocrats who make them miserable); Iran would still continue its drive to expunge American influence from the Middle East; and al Qaeda would still seek to murder Americans and other Westerners. In 2006 former U.N. weapons inspector in Iraq Scott Ritter published "Target Iran: The Truth About the White House's Plans for Regime Change" (ISBN 978-1-56025-936-7). In his book he stated that certain Israelis and pro-Israel elements in the United States were trying to push the Bush administration into war with Iran. He also accuses the U.S. pro-Israel lobby of dual loyalty and outright espionage (see Lawrence Franklin espionage scandal). American journalist Michael Massing argues that there is a lack of media coverage on the Israel lobby and posits this explanation: "Why the blackout? For one thing, reporting on these groups is not easy. AIPAC's power makes potential sources reluctant to discuss the organization on the record, and employees who leave it usually sign pledges of silence. AIPAC officials themselves rarely give interviews, and the organization even resists divulging its board of directors." Massing writes that in addition to AIPAC's efforts to maintain a low profile, "journalists, meanwhile, are often loath to write about the influence of organized Jewry. ... In the end, though, the main obstacle to covering these groups is fear." Steven Rosen, a former director of foreign-policy issues for AIPAC, explained to Jeffrey Goldberg of The New Yorker that "a lobby is like a night flower: it thrives in the dark and dies in the sun." Walt and Mearsheimer undermine our intelligence by assuming that we are simply being manipulated. ... If the lobby is so influential over the media, how were Walt and Mearsheimer given such space in every major news outlet in the country to express their 'dangerous' views? You want to tell me that a force that can impel us to got [sic] to war in Iraq can't find a way to censor two academics? Not much of a lobby, now is it? Writing for the Columbia Journalism Review, Beckerman cites examples of op-eds critical of Israel from several major U.S. newspapers and concludes that an equally compelling argument could be made that the Israel lobby doesn't control the media. Itamar Rabinovich, writing for the Brookings Institution, wrote, "The truth of the matter is that, insofar as the lobby ever tries to intimidate and silence, the effort usually causes more damage than it redresses. In any event, the power of the lobby to do that is very modest." ^ Medved, Michael. "What the Evangelicals Give the Jews." Commentary. May 2012. October 2, 2012. ^ Valley of vision: or, The dry bones of Israel revived : an attempted proof, from Ezekiel, chap. xxxvii, 1-14, of the restoration and conversion of the Jews, George Bush, 1844 "When the Most High accordingly declares that he will bring the house of Israel into their own land, it does not follow that this will be effected by any miraculous interposition which will be recognized as such. ... The great work of Christians, in the mean time, is to labor for their conversion. In this they are undoubtedly authorized to look for a considerable measure of success, though it may be admitted that the bulk of the nation is not to be converted till after their restoration; for it is only upon the coming together of bone to his bone that the Spirit of life comes into them, and they stand up an exceeding great army." ^ Dr. Michael Oren, address before the American Israel Public Affairs Committee Policy Conference 2007, delivered March 11, 2007; quoted in Foxman, The Deadliest Lies, pp. 17-18. ^ Paul Charles Merkley, The Politics of Christian Zionism, 1891–1948, 1998, p. 68 ff. ^ "Academic Awards". American Jewish Historical Society. ^ Rubenberg, Cheryl (1986). Israel and the American National Interest: A Critical Examination. University of Illinois Press. p. 27. ISBN 978-0-252-06074-8. ^ Collins, Larry and Dominique Lapierre. O Jerusalem! New York: Simon and Schuster, 1988. p. 27. ^ George Lenczowski, American Presidents and the Middle East, (1990) p. 28, cite, Harry S. Truman, Memoirs 2, p. 158. ^ Spiegel, Steven (October 15, 1986). The Other Arab-Israeli Conflict: Making America's Middle East Policy, from Truman to Reagan. University Of Chicago Press. p. 52. ISBN 978-0-226-76962-2. ^ Kenen, Isaiah (1981). Israel's Defense Line: Her Friends and Foes in Washington. Prometheus Books. p. 110. ISBN 978-0-87975-159-3. ^ Abraham Ben-Zvi, Decade of Transition: Eisenhower, Kennedy, and the Origins of the American-Israel Alliance, Columbia University Press, 1998. ^ George Friedman, The Israel Lobby in U.S. Strategy, September 4, 2007 The Israel Lobby in U.S. Strategy | STRATFOR. ^ Benhorin, Yitzhak. "Israel still top recipient of US foreign aid." Ynetnews. August 2, 2007. December 13, 2012. ^ AIPAC Web Site AIPAC - Learn About AIPAC. Retrieved April 18, 2007. ^ Faith and Foreign Polich: A View from the Pews, James L. Guth; John C. Green; Lyman A. Kellstedt; Corwin E. Smidt, The Brandywine Review of Faith & International Affairs, 1543-5725, Volume 3, Issue 2, 2005, Pages 3 – 10. ^ a b c The Restoration of Israel: Christian Zionism in Religion, Literature, and Politics, Gerhard Falk, 2006. ^ Ambrosio, Thomas, Ethnic identity groups and U.S. foreign policy, Praeger Publishers, 2002. ^ a b c d e f g h i j k Mitchell Bard The Israeli and Arab Lobbies", Jewish Virtual Library, published 2009. Retrieved October 5, 2009. ^ "Pro-Israel". opensecrets.org. Archived from the original on April 10, 2008. ^ a b "Onward, Christian Zionists", by Jennifer Rubin, August 2, 2010, Vol. 15, No. 43, Weekly Standard. ^ Danny Ben-Moshe, Zohar Segev, Israel, the Diaspora, and Jewish Identity, Sussex Academic Press, 2007, ISBN 978-1-84519-189-4, Chapter 7, The Changing Identity of American Jews, Israel and the Peace Process, by Ofira Seliktar, p126 . Prime Minister Yitzak Rabin's handshake with Yasir Arafat during the 13 September  White House ceremony elicited dramatically opposed reactions among American Jews. To the liberal universalists the accord was highly welcome news. ... However, to the hard-core Zionists --- the Orthodox community and right wing Jews --- the peace treaty amounted to what some dubbed the 'handshake earthquake.' From the perspective of the Orthodox, Oslo was not just an affront to the sanctity of Eretz Yisrael, but also a personal threat to the Orthodox settlers ... in the West Bank and Gaza. For Jewish nationalists ... the peace treaty amounted to an appeasement of Palestinian terrorism. Abandoning any pretense of unity, both segments began to develop separate advocacy and lobbying organizations. The liberal supporters of the Oslo Accord worked ... to assure Congress that American Jewry was behind the Accord and defended the efforts of the [Clinton] administration to help the fledgling Palestinian authority (PA) including promises of financial aid. ... Working on the other side of the fence, a host of Orthodox groups, ... launched a major public opinion campaign against Oslo. ... Hard-core Zionists also criticized, often in harsh language, [the Labor government] architect[s] of the peace accord. Not only was the Israeli electorate divided on the Oslo accords, but so, too, was the American Jewish community, particularly ... among the major New York and Washington-based public interest groups. U.S. Jews opposed to Oslo teamed up with Israelis "who brought their domestic issues to Washington" and together they pursued a campaign that focused most of its attention on Congress and the aid program. ... The Administration, the Rabin-Peres government, and some American Jewish groups teamed on one side while Israeli opposition groups and anti-Oslo American Jewish organizations pulled Congress in the other direction. ^ "Jews and the 2008 Election". Commentary Magazine. Archived from the original on October 7, 2009. ^ a b c d e f g h i Stephen Zunes, The Israel Lobby: How Powerful is it Really? Archived May 16, 2006, at the Wayback Machine, Foreign Policy in Focus, May 16, 2006. Retrieved August 27, 2006. ^ a b c Mearsheimer, John J. and Walt, Stephen. The Israel Lobby and U.S. Foreign Policy, London Review of Books, Volume 28 Number 6, March 22, 2006. Retrieved March 24, 2006. ^ a b Dershowitz, Alan. The Case For Peace: How the Arab-Israeli Conflict Can Be Resolved. Hoboken: John Wiley & Sons, Inc., 2005. ^ "Mission & Principles". J Street: The Political Home for Pro-Israel, Pro-Peace Americans. Retrieved February 15, 2019. ^ Cohen, Patricia. Backlash Over Book on Policy for Israel - The Israel Lobby and U.S. Foreign Policy. New York Times. August 16, 2007. July 4, 2009. ^ Jeffrey S. Helmreich. "The Israel Swing Factor: How the American Jewish vote influences U.S. elections". Retrieved October 5, 2009. ^ Amy Wilentz, Who's Afraid of Jimmy Carter?, New York Magazine. July 20, 2008. Retrieved July 22, 2008. ^ Pro-Israel: Long-Term Contribution Trends, Center for Responsive Politics. Retrieved December 7, 2008. ^ Glenn Frankel. A Beautiful Friendship. The Washington Post. July 16, 2006. ^ a b c The myth of the 'Jewish lobby' Archived June 29, 2006, at the Wayback Machine, Frontline (magazine), 20(20), September 27, 2003. Retrieved August 30, 2006. ^ a b c Michael Massing, The Israel Lobby, The Nation, June 10, 2002. Retrieved August 27, 2006. ^ Mark Jurkowitz, Blaming the Messenger Archived February 13, 2009, at the Wayback Machine, Boston Globe Magazine February 9, 2003: 10, History News Network (George Mason University) April 24, 2006. ^ Farago, Yonit (July 28, 2006). "Israel backed by army of cybersoldiers". The Times. London. Retrieved May 5, 2010. ^ "Israel's newest PR weapon: The Internet Megaphone". The Jerusalem Post - JPost.com. ^ "Mission and Mandate -". israeloncampuscoalition.org. Archived from the original on May 13, 2007. ^ "Coalition Votes Not To Toss Liberal Zionists". The Jewish Daily Forward. January 26, 2007. Archived from the original on September 29, 2007. ^ Scott Jaschik (October 23, 2007). "A Call to Defend Academic Freedom". Inside Higher Ed. Archived from the original on November 4, 2007. ^ "Greek American and Jewish American Community Leaders Come Closer". greekreporter.com. ^ "Ambassador hosts congressional Hellenic-Israel caucus". israelemb.org. Archived from the original on February 21, 2015. ^ "New Greek-Israeli Committee in U.S Congress". greekreporter.com. ^ "Israel's US envoy hosts meeting on Israeli-Greek-Cypriot ties". The Times of Israel. ^ "Launch of the new Caucus "Congressional Hellenic-Israeli Alliance (2/13/2013) - Embassy News". mfa.gr. Archived from the original on April 12, 2013. ^ "Congressman Gus Bilirakis". house.gov. ^ "New congressional Hellenic-Israel alliance". capital.gr. ^ "Embassy hosts congressional 'Hellenic-Israel' caucus - World". Jewish Journal. ^ "BILIRAKIS AND DEUTCH: Hellenic-Israeli partnership strengthens democracy". The Washingtion Times. ^ "AJC Mourns the Passing of Greek-American Leader Andrew Athens". AJC: Global Jewish Advocacy. Archived from the original on April 14, 2013. ^ a b Foxman, Abraham. "The deadliest lies: the Israel lobby ...." Google Books. July 20, 2009. ^ Rosenblum, Jonathan. "Paper on 'Israel Lobby' Poses Threat." Jewish Journal. April 27, 2006. July 20, 2009. ^ a b Dershowitz, Alan. "The Big New Lie." Archived December 24, 2007, at the Wayback Machine Alan M. Dershowitz. July 20, 2009. ^ a b Safire, William (2008) . "China Lobby". Safire's Political Dictionary (Google Book Search) (Revised ed.). Oxford; New York: Oxford University Press. p. 118. ISBN 978-0-19-534061-7. LCCN 2007033114. OCLC 165082593. Retrieved July 20, 2009. ^ "The Australian". November 17, 2007. Archived from the original on November 21, 2007. ^ Etzioni, Amitai (March 28, 2008). "Small Lies, Big Lies, and the Israel Lobby (Part II)". Huffington Post. ^ Mearsheimer, John J.; Walt, Stephen M. (2007). The Israel lobby and U.S. foreign policy (1st ed.). Toronto: Viking Canada. p. 113. ISBN 978-0-670-06725-1. ^ Mearsheimer and Walt (2007), p160. ^ Mearsheimer and Walt (2007), p10. ^ Mearsheimer and Walt (2007), p10-11. ^ "Breaking News Videos, Story Video and Show Clips - CNN.com". CNN. December 13, 2013. ^ a b Frankel, Glenn (July 16, 2006). "A Beautiful Friendship?". The Washington Post. Retrieved May 5, 2010. ^ "U.S. intelligence candidate pulls out after objections". Reuters. ^ "Freeman Withdraws From Intel Position - 44 - washingtonpost.com". washingtonpost.com. ^ Freeman, Charles, "Charles Freeman's Statement in Wake of Withdrawal From Intelligence Post", Wall Street Journal, March 11, 2009. ^ Isikoff, Michael and Mark Hosenball. "Facing Opposition, Obama Intel Pick Pulls Out." Newsweek. March 10, 2009. March 15, 2009. ^ Bolton, Alexander. "Lawmakers deny Freeman's Israel lobby charges." TheHill.com. March 12, 2009. March 12, 2009. ^ Brzezinski, Zbigniew. "A Dangerous Exemption." Foreign Policy July 1, 2006: 63. ^ Chomsky, Noam (March 28, 2006). "The Israel Lobby?". ZNet. Archived from the original on April 17, 2009. Retrieved January 13, 2009. ^ "The Pro-Israel & Pro-Arab Lobbies - Jewish Virtual Library". jewishvirtuallibrary.org. ^ Facts About Israel. Jerusalem: Israel Ministry of Foreign Affairs, 2010. p. 337-338. ^ Benhorin, Yitzhak. "American citizens rank Israel 6th on list of favorite countries." Ynetnews. January 1, 2014. December 31, 2013. ^ "Page not found - The Washington Institute for Near East Policy". washingtoninstitute.org. ^ a b c "Publications." The Washington Institute for Near East Policy. November 2011. November 7, 2011. ^ a b Oren, Michael B. "Israel Is Now America's Closest Ally." The Wall Street Journal. May 7, 2008. May 7, 2008. Powerful interest groups lobby against Israel in Washington while much of American academia and influential segments of the media are staunchly opposed to any association with Israel. How does the alliance [between the United States and Israel] surmount these challenges? One reason, certainly, is values – the respect for civic rights and the rule of law that is shared by the world's most powerful republic and the Middle East's only stable democracy. There is also Israel's determination to fight terror, and its willingness to share its antiterror expertise. ... The admiration which the U.S. inspires among Israelis is overwhelmingly reciprocated by Americans, more than 70% of whom, according to recent polls, favor robust ties with the Jewish state. ^ Goldberg, Jeffrey. "The Usual Suspect." The New Republic. 8 October 2007. 24 January 2009. ^ "The Washington Institute Podcast." Impact of the Gaza Flotilla Incident: Implications for Middle East Politics and U.S. Policy Implications for Middle East Politics and U.S. Policy. June 17, 2010. iTunes Store. Web. June 22, 2010. ^ Goldberg. "Friends Forever?" Foreign Policy. 25 April 2011. 26 April 2011. ^ "Groups Fear Public Backlash Over Iran". The Jewish Daily Forward. February 2, 2007. ^ "Book: Israel, Lobby Pushing Iran War". The Jewish Daily Forward. December 29, 2006. ^ Jeffrey Goldberg, Real Insiders, The New Yorker, July 4, 2005. Retrieved August 27, 2006. ^ Beckerman, Gal. "CJR: The Israel Lobby Doesn't Control the Media." Columbia Journalism Review. 2007 25 June 2010. ^ Rabinovich, Itamar. "Testing the 'Israel Lobby' Thesis." Archived June 8, 2010, at the Wayback Machine Brookings. March/April 2008. June 25, 2010. ^ "The Diane Rehm Show - One of her guests is always you". The Diane Rehm Show. Archived from the original on December 21, 2006. Nasser Aruri. Dishonest Broker: The Role of the United States in Palestine and Israel. South End Press, 2003. ISBN 978-0-89608-687-6. Kirk J. Beattie. Congress and the Shaping of the Middle East. Seven Stories Press. 2015. ISBN 978-1-60980-561-6. Zev Chafets. A Match Made in Heaven: American Jews, Christian Zionists, and One Man's Exploration of the Weird and Wonderful Judeo-Evangelical Alliance. HarperCollins, 2007. ISBN 978-0-06-089058-2. Paul Findley. They Dare to Speak Out: People and Institutions Confront Israel's Lobby. Lawrence Hill, 2003. ISBN 978-1-55652-482-0. Paul Findley. Deliberate Deceptions: Facing the Facts About the U.S.-Israeli Relationship. Lawrence Hill, 1995. ISBN 978-1-55652-239-0. Abraham H. Foxman. The Deadliest Lies: The Israel Lobby and the Myth of Jewish Control. Palgrave MacMillan, 2007. Glenn Frankel. A Beautiful Friendship. The Washington Post. July 16, 2006. Murray Friedman. The Neoconservative Revolution: Jewish Intellectuals and the Shaping of Public Policy. Cambridge University Press, 2006. ISBN 978-0-521-54501-3. Benjamin Ginsberg. The Fatal Embrace: Jews and the State. University of Chicago Press, 1999. ISBN 978-0-226-29666-1. J.J. Goldberg. Jewish Power: Inside the American Jewish Establishment. Basic Books, 1997. ISBN 978-0-201-32798-4. D. H. Goldberg. Foreign Policy and Ethnic Interest Groups: American and Canadian Jews Lobby for Israel. Greenwood Press, 1990. ISBN 978-0-313-26850-2. Stephen J. Green. Taking Sides: America's Secret Relations With Militant Israel. William Morrow & Co., 1984. ISBN 978-0-688-02643-1. Matthew Coen Leep. "The Affective Production of Others: United States Policy towards the Israeli-Palestinian Conflict," Cooperation and Conflict 45(3): 331-352 (2010). Douglas Little. American Orientalism: The United States and the Middle East since 1945. University of North Carolina Press, 2004. ISBN 978-0-8078-5539-3. James Petras. The Power of Israel in the United States. Clarity Press, 2006. ISBN 978-0-932863-51-5. Cheryl Rubenberg. Israel and the American National Interest: A Critical Examination. University of Illinois Press, 1989. ISBN 978-0-252-06074-8. Stephen Schwartz. Is It Good for the Jews? : The Crisis of America's Israel Lobby. Doubleday, 2006. ISBN 978-0-385-51025-7. Jerome Slater. "The Two Books of Mearsheimer and Walt," Security Studies 18:1 (2009): 4-57. Janice Terry. U.S. Foreign Policy in the Middle East: The Role of Lobbies and Special Interest Groups. Pluto Press, 2005. ISBN 978-0-7453-2258-2. Edward Tivnan. The Lobby: Jewish Political Power and American Foreign Policy. Touchstone Books, 1988. ISBN 978-0-671-66828-0. Timothy P. Weber. On the Road to Armageddon: How Evangelicals Became Israel's Best Friend. Baker Academic, 2005. ISBN 978-0-8010-3142-7. Former Envoy: Israel Lobby Not All-Powerful - transcript of Dennis Ross' interview at NPR Morning Edition July 7, 2006. VPRO page about 2007 show "The Israel Lobby", VPRO Youtube clip of program, VPRO Video. This page was last edited on 3 April 2019, at 20:08 (UTC).